Community radio stations are operated, owned, and influenced by the communities they serve. They are generally non-profit and provide a mechanism for enabling individuals, groups, and communities to tell their own stories, to share experiences and, in a media-rich world, to become creators and contributors of media that is locally relevant. Nalamdana’s Thendral Community Radio is a non-commercial radio station, located in Nalamdana’s own office in Neelankarai. 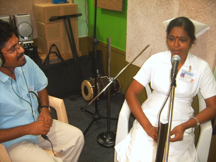 Thendral CR was inspired by Nalamdana’s cable radio work at the Government Hospital for Thoracic Medicine in Tambaram. 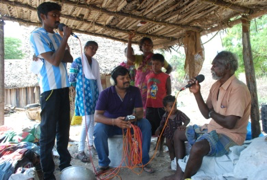 Understanding and appreciating the effective reach of the cable radio at GHTM (Tambaram), Rotary Club of Madras Coromandel, Rotary district 3230 came forward to support Nalamdana in this initiative and co-sponsored (with Nalamdana) the establishment of Thendral Community Radio. This included support for equipment, transmitter, antenna, radio tower and related accessories through donations from Royal Enfield and Coromandel Cement Chennai and matching grant #76564 from the Rotary Foundation. Thendral aims to engage the surrounding fishing communities, schools, business and other establishments in creating programs for them (by them) in Neelankarai, South Chennai. Thendral CR has been broadcasting programs on reproductive health, HIV/AIDS, health and hygiene, women’s and children’s rights, law and other educational topics. Additionally they cover local issues as per community demand. Thendral also broadcasts special programmes according to festivals/ special days where they bring in experts from the field. The official launch of Thendral CR was held on 22nd January, 2014. Thendral CR has increased the Transmission hours to 16 hours a day all seven days a week with fresh and innovative programme formats effective from 11th June 2016. Thendral CR caters to education, music, environmental awareness, health and hygiene, women empowerment, celebrity interview, history, programme on laws and rights, alcoholic / drug addiction, road safety, child rights and safety, maternal and child health, water and sanitation, HIV/AIDS, TB and special programmes for fishermen community. Half of Thendral’s programmes have active community participation. Thendral CR has 200 hours of programmes of Infotainment (information + education), edutainment and entertainment genre. This reaches to all class and categories of the community – small scale business entrepreneurs, fishermen community, home makers and community based achievers, SHG women, school and college students and also the commuters. Thendral’s coverage area: According to the 2001 censes the population in Neelankarai is recorded to be 15,688. The reach of Thendral CR is said to be 6 kilometres of Neelankarai, Chinnnaneelankari, Palavakkam, Vettuvangani, Perungudi, OMR – Jain college, Thoraipakkam. 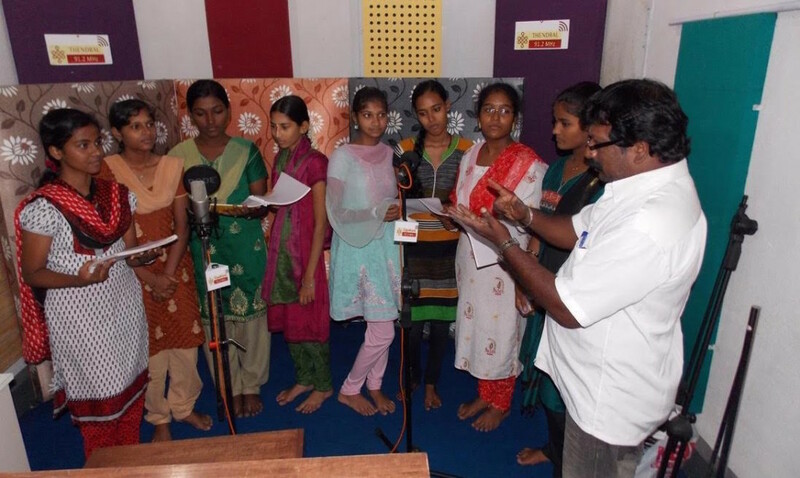 Reach Akshaya, Chennai : Best Community Radio Programme on TB – 2015 Cash prize, citation and certificate awarded.